Where have all the Cowboys gone? Back to Dallas. Led by Robert Griffin III and Alfred Morris, the Washington Redskins claimed their first NFC East division championship since 1999 and their first trip to the postseason since 2007 in a 28-18 victory over their fiercest rival. 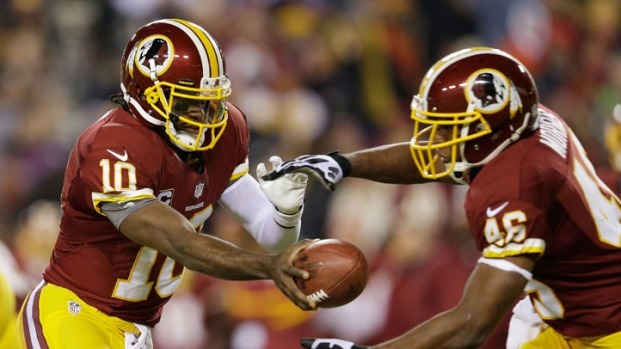 RGIII finished with just 100 yards passing, but rushed for 63 yards and one touchdown. Meanwhile, Morris finished with 200 yards, three touchdowns and a new franchise record as the single-season rushing leader, passing Clinton Portis's mark of 1,516 set in 2005. A sloppy and scoreless first quarter for both teams -- Tony Romo threw two interceptions and Kai Forbath finally missed a field goal when his 37-yard attempt hit the right upright, among other things -- gave way to a slightly more composed second quarter as Washington and Dallas traded touchdowns. First, Jason Witten hauled in a nine-yard touchdown pass from Romo, which was then answered by Morris's 17-yard run that tied the game at 7-7 about five minutes later. Griffin's 10-yard run in the third quarter put the 'Skins up 14-7 and Morris added a 32-yard touchdown run in the fourth quarter to extend Washington's lead to 21-10, but the Cowboys cut the lead to 21-18 on a Kevin Ogletree 10-yard catch and two-point conversion. Dallas, which entered the game with an NFL-best five fourth-quarter comebacks, then forced Washington to punt with a chance to complete another one late in the game, but Romo threw his third interception of the game to Rob Jackson. Morris then sealed the victory with his third and final touchdown with just over one minute remaining. It's hard to believe that less than two months ago, Washington was 3-6 heading into its bye week, but seven straight wins -- the team's first seven-game streak in 16 years -- has propelled them into a first-round matchup against the Seattle Seahawks at 4:30 p.m. next Sunday at FedEx Field.